Developer Wade Caughman and his partner Wes Taylor are buying nearly 4 acres of land at the State and Meeting street intersection from the city of West Columbia for $3.85 million. “It is going to be a unique and one-of-a-kind shopping experience that most people wouldn’t think is possible,” Caughman said. Caughman has developed some of the most expensive condos in Columbia’s Vista but is new to commercial development. 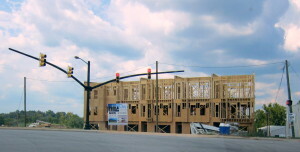 The multistory development, bounded by Alexander, Meeting and State streets and Court Avenue, sits between upscale housing along the Congaree River’s west bank, which Caughman also is developing, and the growing commercial area on State Street, one block away. Across the river are the highend City Club condos Caughman is building on Gervais Street in Columbia, across from the State Museum. Caughman also has given the city a letter of intent for the four acres that were once home to the O’Brien’s Restaurant Supply Co., along the river at U.S. 378 and Sunset Boulevard, about a halfblock away. He would build condos there, north of the Bridgepointe condo high-rise, he said. Caughman anticipates having all of his other projects, including City Club and Congaree Park, along West Columbia’s riverwalk/greenway, completed by this spring, when the Meeting Street property closes. The city acquired the land at Meeting and State streets for nearly $3 million in pieces over a number of years and has been shopping for a developer to construct a mixeduse shopping, business and residential destination. “We’ve had offers before now, but they weren’t keeping with our vision,” Mayor Bobby Horton said. A bank, coffee shop, ice cream shop, pizzeria, retail stores and a family-style restaurant already have agreed to be tenants, Caughman said. He declined to name the businesses but said many of the names are regionally known. Caughman also plans to include parking, but does not plan to build a garage. Customers at area business will have a place to park at night, he said. Caughman and city leaders are discussing how much earnest money he will pay next month; he will pay the balance of the cost at the April closing. City leaders met with about seven to eight developers with the goal of creating a unique area along the riverfront. A number of businesses are choosing to move from Columbia’s Vista to West Columbia, including Riggs advertising, which is moving to Meeting Street. The property was once home to a pawnshop, tire seller, used car lot and an antique store. The antique shop, operated by Columbia business woman Cathy Novinger, is still open but plans to move down Meeting Street. The building will be torn down.